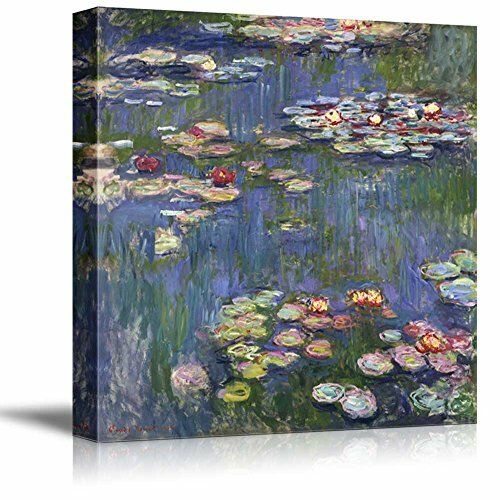 wall26 - Water Lilies by Claude Monet - Canvas Art Wall Decor - 16" x 16"
What a pretty painting really pleased. So happy I bought it. As it clearly says in the description, these are machine printed. What was I expecting.. The pixels are visible from 3 feet away. This now hangs in my bathroom. Not bad for the price. Not a substitute for a detailed hand-painted canvas/oil reproduction. Nice print, very pleased. Now where to purchase a frame? This is beautiful. One side is a bit wrinkled, but hope it will stretch out. I am a Monet lover, even if I can't come close to the real thing. As I said, this is lovely. Very fast shipping, thank you. I purchased this to hang in my daughter's room. She loves Monet's water lilies. The colors aren't nearly as vibrant as they appear online, which is disappointing. My daughter loves it though and that's all that matters. Looks great and matches my sofa/pillows amazingly well! (Lazy Boy furniture--blue sofa with "Van Gogh" patterned pillows). Beautiful in our newly painted bathroom. was what I thought it would be.